This vegetable cutlet recipe comes to rescue when kids are not so enthusiastic about eating vegetables. It is a favorite of kids as well as grown ups. Kids are willing to eat the vegetables that they wouldn't touch otherwise when these vegetables are given to them in the form of a cutlet. My daughter refuses the beetroot in any other form but in a cutlet, it is acceptable. Ready to eatvegetable cutlets in the image below. My daughter is willing to have Vegetable cutlets for breakfast, lunch and dinner and school lunch and picnic and snacks and all the other times. She also loves veg Frankie. This vegetable cutlet recipe uses shallow frying method. So even those who are dieting, are avoiding fats can enjoy these without feeling guilty. mixture and cutlets ready to cook. Salt - 1 tsp or according to taste. Boil potatoes, peel them and grate or mash them. In a frypan or karahi, heat 1 tbsp oil. Add chopped onion. Fry for a minute. Add ginger, garlic paste chopped green chilies. Fry for a minute. 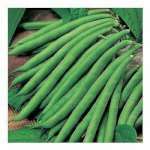 Add chopped French beans. Cover and let cook till beans are almost done. Add grated beetroot and carrots. Cover and cook for 2 minutes. Stir once in a while. Do not add any extra water. There will be enough moisture in carrots and beetroots. Once the vegetables are cooked remove cover and continue cooking till the mixture is dry. Add garam masala (optional). Cool the mixture and mash it a little. Once the mixture is completely cool, add boiled and grated potatoes. Add salt, more green chilies, paste or chopped fine, if you like the taste. Add bread crumbs and mix. The mixture should not be very soft. It should hold shape when you make a ball. If it is too soft, add some more bread crumbs. Divide the mixture in lime sized balls and then make in flat patties. You may make your patties round, heart shaped, oblong or square, as you wish. Keep aside. Make a thin batter with maida(plain flour) and water. Dip the cutlets in this mixture and roll in breadcrumbs or rava. Coat the cutlet well with it. Heat a fry pan or tava/ girdle and reduce the flame to medium. Add a few spoonfuls of oil in the pan. Place the cutlets , 4-5 at a time - depending on the size of your pan. When one side of the cutlet is cooked, turn the cutlets. Add a spoonful of oil around the cutlets. Cook on the other side till a few brown spots appear. Cook all the Cutlets this way. Serve hot with ketchup, mint chutney or tomato chutney , tamarind chutey, onion rings etc. 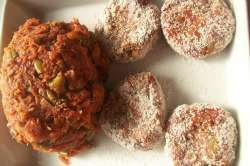 You may use rava or bread crumbs or rice flour to roll the cutlets. Add some oats, powdered to the vegetable mixture to make it more healthy. It will also dry out the mixture fast. Add oats after the carrots are cooked. You may deep fry the cutlets if you wish. You may cook the green beans in the pressure cooker and add to the mixture after cooking carrots. Do not use the water if any. You may also cook the beetroot in the pressure cooker and then grate it. And add along with carrots. There is no need to precook carrots and the grated carrots cook fast. Make sure the mixture is semi dry before taking off fire. If you do not like the beetroot coloring all the vegetables, avoid it. Make sure the mixture is cool before you add boiled and mashed potatoes and bread crumbs. Do not add to the hot mixture. 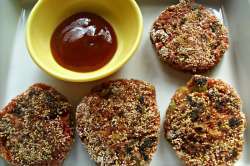 I am sure you will find this Vegetable Cutlet Recipe useful. Enjoy with your family.